Cypress Drills 107 meters of 1134 ppm Lithium, Expands Mineralized Zone in Clayton Valley, Nevada | Cypress Development Corp.
Vancouver, BC - Cypress Development Corp. (TSX-V: CYP) (OTCBB: CYDVF) (Frankfurt: C1Z1) ("Cypress" or the "Company") is pleased to announce results from two more core holes from the Company's Clayton Valley, Nevada drill program. Today's results include an intersection of 107 meters of 1134 ppm Li within hole DCH-13 and 76 meters of 733 ppm Li within hole DCH-14, both located on the Dean property. Hole DCH-13 represents one of the longest and higher grade drill results from the property to date as Cypress continues to expand the lithium mineralized zone. The intersections reported are the weighted average of all core recovered in each hole, from surface to the end of the hole. The results continue to demonstrate the presence of lithium mineralization over a large thickness of claystone. The two holes are located in between the fence of holes in DCH-10, -11 and -12, to the southwest and DCH-09, to the northeast, and support the observed continuity of mineralization over a long northeast trend, extending approximately 4 kilometers in length and 2 kilometers in width across the Dean property. In DCH-13, the lithium values increased at depth, starting 24.8 meters below surface, and averaging 1206 ppm Li over 88.4 meters. DCH-13 ended in 3.0 meters of 912 ppm Li. The hole was terminated due to operating constraints and remains open at depth. The grade increase was observed coincident with a redox boundary, where material above the boundary is oxidized and light grey in color, and material below the boundary it is reduced and dark grey and green to black in color. This redox boundary has been observed at similar depth from surface in other drill holes. Drilling in the fall 2017 program has been completed, with 4 holes drilled on the Glory property to the south. Results from these holes are anticipated later in the month. Notes: ppm=parts per million, m=meters, Avg=average weighted value by sample length. Extraction studies are underway to determine the solubility of the lithium and other mineral constituents within the claystone. Representative samples of oxidized and reduced material from DCH-05 were delivered to SGS in Lakefield, Ontario. These initial bench-scale scoping tests revealed moderate extractions of lithium in sulfuric acid solution, increasing to 74% in both sample types with increasing temperatures. The extractions were achieved with relatively low additions of sulfuric acid for lithium-bearing claystone deposits, measured at a rate of 140 kg to 170 kg of acid per tonne of material. The results are encouraging and clearly indicate that the extractions and acid consumptions of the Cypress' Clayton Valley claystone are significantly better than seen in refractory claystone deposits. Further test work is underway to improve the results by refining the leach conditions, checking for any mineralogical variability across the properties, and determining methods of recovery of the lithium from the leach solutions. Samples were ground to minus-10 mesh and leached with a solution of 5% sulfuric acid for 4 hours at 10% solids. The leach solution was monitored but no additional sulfuric acid was required to maintain the pH below 1.0. The mixture was then filtered and rinsed and residue and solutions submitted for assay. The Company is reviewing drill results. Additional holes are planned for the first quarter of 2018 to infill and connect the Dean and Glory areas of drilling. The Company anticipates the further work will support a resource estimation and preliminary economic assessment (PEA) upon completion of the drilling, metallurgical studies and gathering necessary economic data. 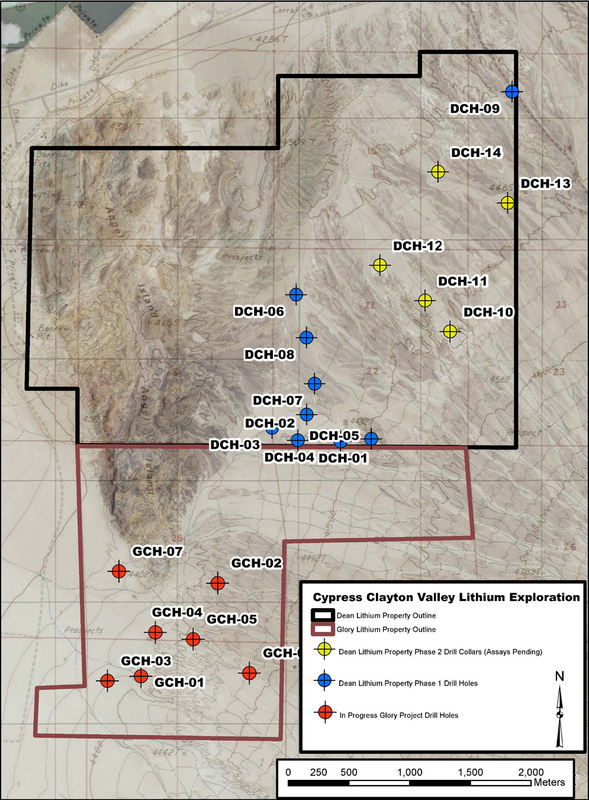 Cypress believes its lithium-bearing claystone deposit in Clayton Valley, which is located due east of Albemarle's Silver Peak lithium brine operation, has the potential to become a significant source of lithium. The Company is working to advance the project into development by following its program of exploration drilling and metallurgy. Cypress is very active in Nevada, with its geological team focused on systematically exploring its properties for lithium.